When I bought my first DSLR camera (upgrading from a point and shoot) I imagined the buying a “decent” camera would instantly improve my photography. Buying this camera, I assumed would bring outstanding quality to my images and I had visions of my masterpieces being exhibited and published. Students our courses at Beck Photographic told me that they were getting good pictures, portraits mostly, with a clear subject and the back ground out of focus, but they were unsure of how to recreate this. One of the subjects that we look at with our students is depth of field and how this can affect composition. Some simple exercises and experimenting with cards (of flower heads or teddy bears it doesn’t really matter!) soon brings a practical understanding of how to manage depth of field.) 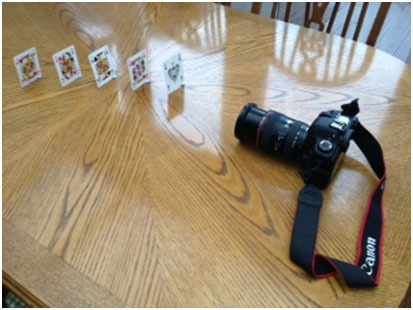 Set your cards and camera out like this. My camera is about 20cm from the first card. 1) The larger the aperture the narrower the depth of field. We spend a lot of time ensuring that students understand that f2 is a large aperture, and f22 is a small aperture (f indicates it’s a fraction , ½ is larger than 1/22!) in Aperture priority (AV on Canon). Set the aperture to your largest (the smaller the f number remember, F4 in my case!). 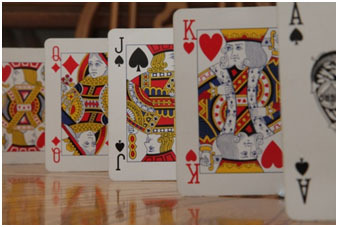 Focus on one of the middle placed cards (Jack of Spades in this case). Take the picture and you should see this card in clear focus, and the others being thrown out of focus. 2) The smaller the aperture the wider the depth of field. Now keep everything the same but change the aperture to your narrowest (big f number). 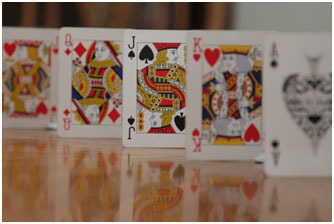 At the same distance and focusing on the same card, take your picture. 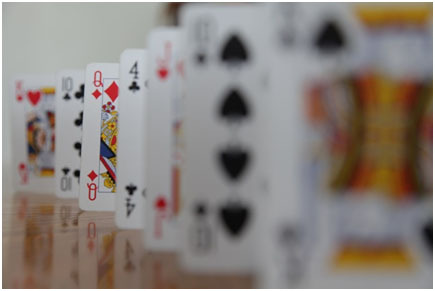 You will end up with more cards in focus! Magic isn’t it? 3) The closer you are to the focus point, the more pronounced the depth of field.Take your pictures again using a large aperture. Take a picture close up, and then move the camera further away. Don’t be tempted to fiddle with your zoom, we’re changing one thing at a time! The further away you move from the subject, the wider the depth of field is. The technical term for this is Focal Distance. Compare this picture taken from 60 cm away compared with the first from 20 cm away. I have cropped the picture! 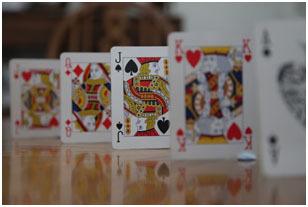 4) The effect of zooming.Have your camera about 20 cm from the cards. Select your shortest focal length (wide angle) and take a picture. 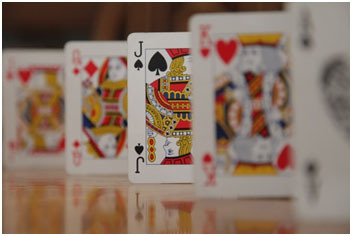 Quite a few of the cards should be in focus, we have a wide depth of field. 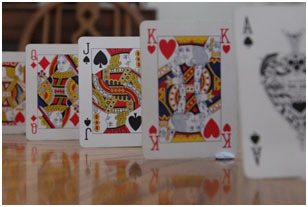 To reduce the depth of field, zoom in, increasing the focal length(zooming in) which throws more of the cards out of focus. 2) How far away from the object you are. 3) The focal length of your lens. About the author – Richard Tester designs the training courses run by Beck Photographic in Wellingborough, England. Having recently retired as the Head Teacher of a large Primary School, he is now free to indulge as much time as he can in photography. He has recently teamed up with the professionals at Beck Photographic to provide fun training for all those who have paid out for a DSLR camera but can’t get beyond the automatic mode.